This post was supposed to be about deer at sunrise in Baselland and an early morning trip to the Petite Camargue, but I frightened the deer and didn't make it to the Petite Camargue. Instead of images of deer, you're now getting flowers bugs, birds and a picture of how my Mondays can change. From dawn at Waldweide to wandering around in the city until dusk and all with a Sony 100-400mm. I arrived at Waldweide just before 0500h. With sunrise about 1h30mins away the sky in the distance was starting to show an ever so slight red hue. According to the forecast, there was a lot of Sahara dust in the air! I made my way through the darkness into the forest and found a place at the edge of an open field. Using some tree trunks and some low hanging branches to hide between, I settled in and put the bag hide over me. I sat there as quietly as I could and watched the sky get brighter, quite happy that the clouds remained as it had been a toss-up between a possible sunrise shoot due to the possibility of colour from the Sahara dust, or trying to take pictures of deer. After sitting there for a couple of hours a buzzard appeared on a fence post that was just a touch too far away for a good image. A short time later the first deer took its first step onto the field, a second one following nervously behind. I gently and ever so slowly moved the camera lens in the direction of the deer, hardly breathing in anticipation of getting an image or two. Then there was a quiet click of plastic hitting plastic and they darted back into the forest while I was looking round for what had made a noise. A lens cap had fallen out of an open pocket and hit my phone which was on the floor beside me. That days lesson was learnt and won't be made again! With no chance of them coming back out at the same location, I decided to move on and try to at least see what I could get over the valley and towards the mountains while I was there. The next three images are the result of that decision. I've included three images to show the difference that the format can make to the image. The third has a different edit and is personally, my favourite. With the sun a long way above the horizon, the red hue from the Sahara dust gone and not a sign of a break in clouds, it was time to move on. Back in Basel and with a change of clothes, head to toe in camouflage is not a good look for walking around the city, I headed towards an old favourite, the Basel Botanical Gardens, and in to the Tropenhaus. There were an unusual amount of people in there and a few children running around. As a result the birds stayed up in the roof, or hidden away in the foliage. I only managed to get a couple of images before I left and moved towards outside. I have no idea what the orchid is, other than an orchid. The Bird, according to the signs at the Botanical Gardens is a White-headed bulbul. I sat next to the open meadow area of the Alpinum. 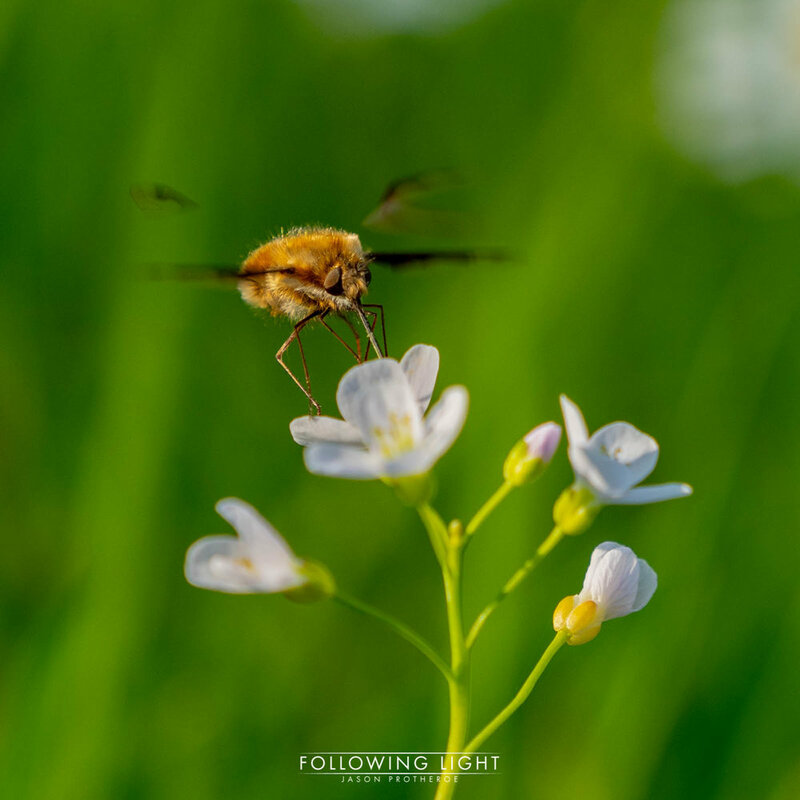 Some hovering bees had caught my eye, only on closer inspection they weren't bees, they were Bee-flies (Bombylius Major). In German they are several names, but the one I like is the 'Großer Wollschweber', which if directly translated means the 'Great Woolley Hoverer', a very fitting name. 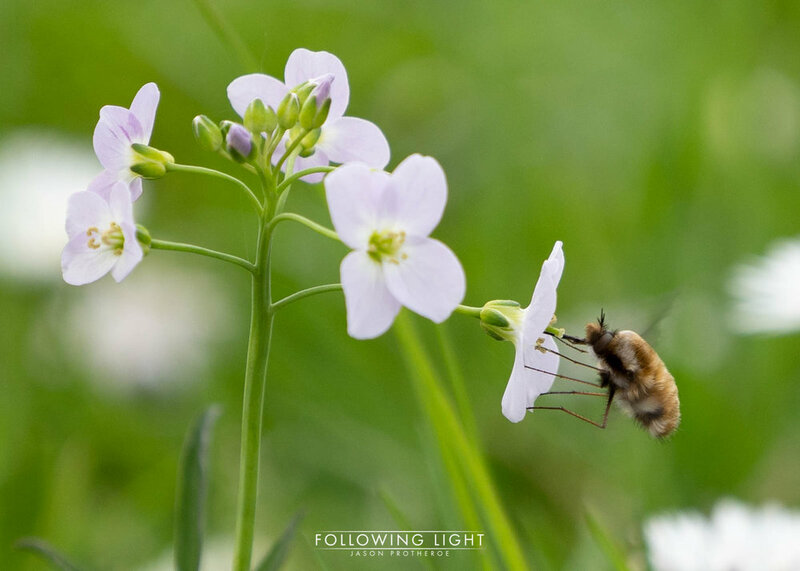 They are fascinating little creatures, which look very much like bees to the naked eye, hovering and darting between flowers heads. Through the lens you can see the difference, especially the elongated mouth parts (proboscis) that's reminiscent of the humming bird beak. The next five images are actually only three, the first pair and the second pair are the same image with a different crop. The third is unique. I needed to get my daily step count up, so I had to stop sitting and move somewhere else. The day before, I had walked past the Basel Zoo and seen for the first time that there were two windows in the wall that offer a view through to the elephant enclosure. They also and more importantly to me at least, offer a close, eye level view of one of the Stork nest platforms. I could 'Kill two birds with one stone' or rather 'shoot two birds with one camera'! Not only would I get some images, but it was also far enough away to be able to reach my step target for that day. Next week, I'll try to be quiet enough to see the deer. I may have to take another look at my hiding place, and camouflage too though.